The Trust held a garden party by kind invitation of the Bishop of Ely in the gardens of The Bishop’s House on 18th June 2014. This was our opportunity to demonstrate the Trust’s recent achievements in helping congregations to fund repairs and improvements to the county’s historic places of worship. 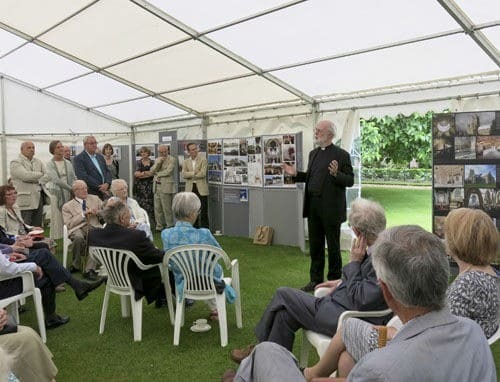 There were displays of recent projects by five local architects and a short talk by our guest, Dr Rowan Williams. As well as promoting their use and repair, the Trust tries to bring to life the history and architecture of the county’s churches and chapels. We continued this educational role at the Garden Party by taking guided groups on short visits to the Monastic Barn and Porta (by kind permission of The King’s School, Ely) and into The Bishop’s House (by kind permission of Bishop Stephen). Dr Williams’ address explored how “history” is interpreted by each of us according to our own circumstances and experiences. Historic church buildings have been at the centre of communities for generations and act as an important trigger for memory in so many different ways. He applauded the work of the Trust and encouraged us to continue by giving us this clear context for our work. We are immensely grateful to Dr Williams for finding the time to join us and sharing his thoughts so willingly. The Party finished in time for members to attend Evensong in the Cathedral at 5:30pm. Other pictures can be seen in the Gallery section. The Trust is grateful to Steve Cole for taking them and they remain his copyright.